SACRAMENTO, CA (November 6, 2018) — As a proud sponsor of SkateMD, a Northern California based 501(c)(3) non-profit organization, Emplicity is excited to help spread the word about their upcoming fourth birthday celebration and fundraiser and wants to encourage friends and clients in the Sacramento area to come out and celebrate four extraordinary years of kindness and skateboarding as well as help fund the program for another year. The event will be held on Sunday, November 11th at Beatnik Studios in Sacramento. The celebration will feature sets by DJ Eve, live music, a beer and wine garden, an out of this world raffle, a silent auction featuring work from local artists and members of the local skateboarding community, an awards program and of course birthday cake! Tickets to the event are just $10, and children 12 years old and under are free. Businesses and individuals who would like to do more than attend can reach out to the SkateMD team at [email protected] to see which sponsorship levels are still available. SkateMD’s mission is to “heal hearts by spreading kindness and skateboarding to special populations of children facing developmental, physical, emotional or family challenges.” The program was founded in 2014 by two friends connected through skateboarding (the “Skate”), Melanie Tillotson (the “M”) and Andrea "Drea" Bibelheimer (the “D”) in response to a viral video of a teenage boy with Autism who was viciously pranked by other teenagers. Drea and Melanie combined their respective backgrounds in community relations and nonprofit leadership with the support of a quickly-formed board of directors, and were able to gain nonprofit status, have a logo and site designed, receive skateboard and gear donations, recruit over 50 volunteers and host their first clinic with 25 children from the community just two months after the viral video surfaced. They’ve been able to hold their free one-on-one skateboard clinics for children with special needs every other month at local skate parks in the Sacramento region for four years running. 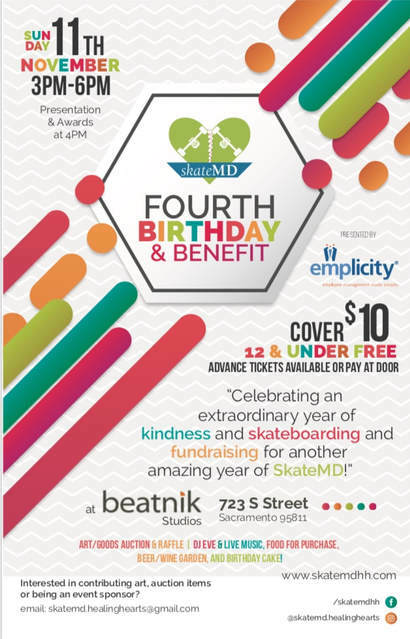 “Emplicity is proud to be a sponsor of SkateMD’s fourth birthday celebration and fundraiser, ” said Vic Tanon, President/CEO of Emplicity. “We hope our friends and clients in the Sacramento area will join us in supporting this amazing organization,” he added. Emplicity the leading local Human Resources Outsourcing provider was founded in 1996 on the principle of making employee management simple. Emplicity is headquartered in Irvine, California with offices in Sacramento, Los Angeles and San Francisco, serving over 6000 worksite employees throughout California. For more information about Emplicity, visit www.emplicity.com. Emplicity understands that HR Outsourcing should be simple and meaningful. As a Professional Employer Organization (PEO), we strive to be a great partner in supporting your business. If you would like to request more information on how we can assist your needs, please reach out to us at 877-476-2339. We are located in California – Orange County, Los Angeles, and the greater Sacramento and San Francisco area. NOTICE: Emplicity provides HR advice and recommendations. Information provided by Emplicity is not intended as a substitute for employment law counsel. At no time will Emplicity have the authority or right to make decisions on behalf of their clients.